As you all know, our current series is rooted in the little letter of 1 John. In it, John states 4 explicit reasons for writing the letter. While we’ve been focusing on John’s 4th reason, we see how all that he writes revolves around all 4 of these ideas. John doesn’t consider his own joy complete or full unless Believers are: Helped to overcome sin in their lives; Are kept from the deceptions of false doctrines; And are uncertain about their salvation status. Sin is a big deal. Truth is a big deal. And Assurance is a big deal. As the Holy Spirit inspired John to write this, we see that our God is not content to let Believers live with some sort of a vague hope that one day He will receive us, but a steadfast and sure hope. “Bless God” Peter says: Merciful as He is, He doesn’t give us a salvation whereby we just “hope” things will work out well he calls it here a “living hope” a hope that is vibrant and that grows. You will remember last week we took time to see how the Bible uses the word faith versus the way it gets used today in popular thought – well we have the same issue here with the word hope. The one who has been born again by the Spirit of God does not just “hope” that someday things will work out well now that they have put their trust in Christ. No, our hope, Biblical hope is far different than that. I understand how most people use the word hope: I may not have any real reason for such and such to happen, but “I hope so”. It is merely the expression of a desired outcome – whether or not there is any real reason to expect that outcome. HOPE: The joyful expectation of the good God has promised us to come at Jesus’ return. It is not a vague, wish-for kind of hope. It is based upon something. It is substantive. It has as its foundation the sure promises of God. And one of the things which belongs to – which is the birthright of – all those who have put their trust in Jesus alone as their sin-bearer and their righteousness, is that we have a promised and therefor a sure future – one which includes our own resurrection from the dead. And as expressed by Grudem in my earlier citation: It is a hope that can grow and increase in strength year by year. In fact, of all the things we’ve looked at thus far as means of assurance – the knowledge and hope of the resurrection is one of two areas we can actively grow in over time. The Word of God’s as the inerrant and ultimate authority in our lives. Having been reconciled to God through Jesus Christ. Adopted as His own. Hating the remaining sin in us – which we also love. An inexplicable affinity for God’s people – no matter how little else we have in common. A rejection of the World’s values for Biblical ones. A reliance upon the indwelling Spirit of Christ. And this morning: Hope in the resurrection. Here’s the question: Can I discern in myself anything of a genuine anticipation of the fulfillment of God’s promises culminating in the resurrection from the dead? And we need to note 2 things here before we come back to the text of 1 John. 1. The World has a poor and destructive counterfeit to this hope. It is what propels suicide in many and undergirds the current rise in euthanasia. It is not the hope of the resurrection, but the desire for a mere end to pain or discomfort. It is in fact hopelessness. When one can see no end to their pain, no prospect of anything changing soon – they can easily, and perhaps understandably give up on life altogether and believe the lie that death will bring the relief they seek. And I say it is a lie because it gives no thought for what comes after death. Among other things, this view assumes there is no afterlife where judgment for sin before a holy God still awaits. No giving of an account of how we lived our lives. It assumes the cessation of temporary pain is the final good, and that there can’t be anything worse after. But this is to ignore the graphic, and in some cases terrifying revelations in the Bible of an eternal Hell to be endured by those who reject Christ and His saving work. And beloved, without the sure hope of the resurrection sustaining us in the darkest and most difficult of times – even Believers can begin to give way to this way of thinking. We can be robbed of our strength and courage altogether. What could sustain Job in the midst of all of his sorrows? Having lost all his worldly wealth, the death of his 10 children on the same day, his painful health, and the arrows of his friends as they misunderstood him and accused him of secret sins that brought his torments upon himself justly – what sustained him? How could he say “Though he slay me, I will hope in him”? Nothing but this: Job 19:25–27a ESV / For I know that my Redeemer lives, and at the last he will stand upon the earth. And after my skin has been thus destroyed, yet in my flesh I shall see God, whom I shall see for myself, and my eyes shall behold, and not another. No matter what happens now, and how this all ends in this life – I know the resurrection awaits. And in this body, I will see my Redeemer, my God face to face. This time will end, and give way to that eternity with Him. 2. The Church has often neglected the resurrection. The sad truth is, much of the blame for Christians being robbed of this aspect of assurance lays squarely in the lap of the Church in how we preach the Gospel, and what we direct people to put their hope in. Remember what Paul said are the essential elements of the Gospel in 1 Cor. 15:1-4? More, in Romans 10:9-10 Paul goes on to make belief in Christ’s resurrection an absolute essential for saving faith. Romans 10:9–10 ESV / because, if you confess with your mouth that Jesus is Lord and believe in your heart that God raised him from the dead, you will be saved. For with the heart one believes and is justified, and with the mouth one confesses and is saved. And yet the wonder and the awe of Jesus’ rising from the dead can often become a sort of an add on. He died for our sins, and that the important part. But as 1 Corinthians 15:12-17 powerfully declares: 1 Corinthians 15:12–17 ESV / Now if Christ is proclaimed as raised from the dead, how can some of you say that there is no resurrection of the dead? But if there is no resurrection of the dead, then not even Christ has been raised. And if Christ has not been raised, then our preaching is in vain and your faith is in vain. We are even found to be misrepresenting God, because we testified about God that he raised Christ, whom he did not raise if it is true that the dead are not raised. For if the dead are not raised, not even Christ has been raised. And if Christ has not been raised, your faith is futile and you are still in your sins. Catch that. If Jesus didn’t rise from the dead, our faith is futile and we are still in our sins. Wow! There is no true Gospel and no true Christianity apart from the truth of Jesus’ resurrection. But when we add to this neglect the current trend in preaching in America and its focus upon having a healthy, wealthy and happy life NOW – without regard for our own resurrection – we have a perfect storm of deceit that robs Believers of living in the joyful expectation of the good has promised us to come at Jesus’ return. A Heaven-less and Hell-less Gospel robs us of the hope we are meant to have, and thus undermines the assurance we are meant to have in our salvation. But for true Christians, we have an extraordinary dynamic to take advantage of. If we are fixing our hope on a genuine and divine promise, we can grow more and more assured in it. The principle is a simple one: The more we acquaint ourselves with and meditate on the promises of God, the more real they become and the more our anticipation of them grows. The more an engaged Gal thinks about and prepares for her wedding day, the more real it becomes and the more her anticipation grows. This principle functions for us as those betrothed to Christ – or at least it should. But if we are not setting our focus upon that day, then we lose that sweet and motivating anticipation. An anticipation which grows and excites us more and more. This then brings us back to our text in 1 John 2:28–3:3 ESV / And now, little children, abide in him, so that when he appears we may have confidence and not shrink from him in shame at his coming. If you know that he is righteous, you may be sure that everyone who practices righteousness has been born of him. 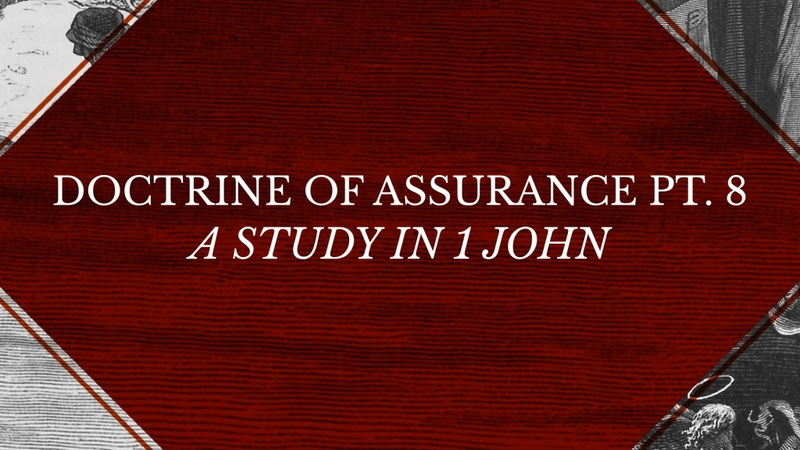 We have 3 things here John puts in front of us which the more Believers look at and contemplate, the more anticipation and assurance grows in our hearts. The 1st is in vs. 28. 1 John 2:28 ESV / And now, little children, abide in him, so that when he appears we may have confidence and not shrink from him in shame at his coming. Abiding in Christ, and not shrinking from Him in shame when Jesus returns. The 1st part is fairly obvious: The more one abides in Jesus – remains in Him, fully puts all of their trust in His atoning sacrifice for their sins in Him alone – is unmoved from the simplicity of the Gospel – the more their confidence in His satisfaction for their sins grows. There is truth in that. But it is all the more true when we are fixing our minds on things God has clearly promised in His Word. The more I rehearse the truths of God’s Word, the surer they become to me. I see His faithfulness to His promises played out in the lives of those recorded in Scripture. I grow more and more familiar with the actual promises and how He states them and affirms and reaffirms them. How He verifies them in His track record and seals them by proofs – like raising Jesus from the dead. It is why Jesus told the Disciples that when the Holy Spirit would come, He would remind them of the things Jesus had said. Because in that reminding, in that going over and over what He said, those things grow more and more concrete in the soul. So it is for you and me today – and why we need to read, and read and re-read the Word. As we do, the things in it solidify in our souls and doubts grow dimmer and dimmer. But then John ties this to the day of resurrection. The reason why we “abide” in Him, why we make sure we reaffirm in our own hearts that we trust in Christ and Christ alone, is that in over time our trust and rest in His finished work grows more and more and increases our confidence in the joy we’ll have at His return – rather than doubts and fears that some sort of punishment is still due. When we really believe He WILL return, and remain faithfully trusting His saving work on our behalf, our HOPE – our joyful expectation in Him grows. Our assurance of our saved state grows. But wherever we doubt Him, or doubt what He has promised – like the resurrection – we injure our own assurance. Refusing to stand anywhere but on the finished work of Christ on our behalf alone – makes us anticipate the resurrection with joy. John’s 2nd point in this regard comes to us in 1 John 3:2 ESV / Beloved, we are God’s children now, and what we will be has not yet appeared; but we know that when he appears we shall be like him, because we shall see him as he is. The more one explores the doctrine of the resurrection, the more one joyfully anticipates a whole new mode of existence. As we looked at earlier, those apart from Christ, have at best some vague hope of some nondescript something after this life. It is a hope with no basis. At worst, it is only the hope that whatever misery they are experiencing in this life will at least end. But for those of us in Jesus – He holds before us the promise of an eternal life in Him that so far eclipses the very best of this one, that this life is less in comparison than a single candle to the light of 1000 suns. We are already God’s children, but what we WILL be is beyond imagination – because we will be like Christ in some unimaginable ways! Listen to Scripture again in 1 Corinthians 15:35–49 ESV / But someone will ask, “How are the dead raised? With what kind of body do they come?” You foolish person! What you sow does not come to life unless it dies. And what you sow is not the body that is to be, but a bare kernel, perhaps of wheat or of some other grain. But God gives it a body as he has chosen, and to each kind of seed its own body. For not all flesh is the same, but there is one kind for humans, another for animals, another for birds, and another for fish. There are heavenly bodies and earthly bodies, but the glory of the heavenly is of one kind, and the glory of the earthly is of another. There is one glory of the sun, and another glory of the moon, and another glory of the stars; for star differs from star in glory. Look at some of those words: Imperishable, glorious, powerful, spiritual – bearing the image of Christ Himself. Just as birds are uniquely designed to fly in the skies, and fish to live in the water and our present bodies to interact with the environment of this physical world – we shall rise to be totally redesigned to exist in the environment of the unveiled presence of the living God and to maximally know, comprehend, experience and enjoy Him. Christian – this is the hope He has stored up for you. This is His goal for you and His promise to you. And if this is just ahead of us – what isn’t bearable to us now? No wonder David could comfort his own heart by praying: Psalm 17:15 ESV / As for me, I shall behold your face in righteousness; when I awake, I shall be satisfied with your likeness. And the amazing thing is, the more the heart is filled with this anticipation, the more your assurance of your position in Christ is buttressed. Exploring the wonder of the resurrection – makes us long for the resurrection. And John has a 3rd point in this: 1 John 3:3 ESV / And everyone who thus hopes in him purifies himself as he is pure. The principle is a simple one here, and one we do not need to draw it out at length. It is just this: As one walks more and more in harmony with God’s Word, in purity, the more confidence they gain in their relationship to God, since they are not offending Him. As we have discussed before, a child’s disobedience cannot alter their status as a true child of their parent – but it can greatly inhibit the intimacy of their relationship, and weaken their confidence in where they stand. Obedience does not and cannot save us. But obedience to God IS a marker of whether or not we are really His. Don Carson puts it this way: “Biblical Christianity never, ever suggests we attract God’s mercy by being good. It never suggests somehow we win brownie points with heaven and secure an abundant entrance by trying hard. Biblical Christianity, nevertheless, does insist on obedience. A. Carson, “1 John 2:3–27,” in D. A. Carson Sermon Library (Bellingham, WA: Faithlife, 2016), 1 Jn 2:3–27. Obedience is not everything, for sure, but it IS something. Again, this is not to say we can set levels of performance. It IS to say that we must have a right relationship to Him in that our desire is to serve Him. And when that desire is not present, there can be no reasonable assurance of salvation. But when that motivation is there – when we have really believed the Gospel and factor into our living today that one day we will be resurrected to stand before Him – that His goal for us in resurrection is to be holy even as He is holy – our relationship to the resurrection informs our behavior, and in the process, reinforces our assurance of salvation. Hence Jesus will say: Luke 6:46 ESV / “Why do you call me ‘Lord, Lord,’ and not do what I tell you? And so Paul would write: 2 Corinthians 5:6–9 ESV / So we are always of good courage. We know that while we are at home in the body we are away from the Lord, for we walk by faith, not by sight. Yes, we are of good courage, and we would rather be away from the body and at home with the Lord. So whether we are at home or away, we make it our aim to please him. Anticipating the resurrection – makes us live life today in the light of it. Taking all of this together – we get precisely what Peter wrote in 1 Peter 1:13 ESV / Therefore, preparing your minds for action, and being sober-minded, set your hope fully on the grace that will be brought to you at the revelation of Jesus Christ. If we are to soberly and soundly face all of the trials and pains of this present life, and even to gain from them – we must set our hopes fully on the grace that will be brought to us in the resurrection. And when this becomes a habit of thought – oh how our assurance of salvation grows. Unless this is the case, today eclipses all. But when this IS the case, it produces an ever increasing confidence, assurance and joyful anticipation. One that will buoy you through the darkest and hardest of times. The great Puritan Richard Baxter grew gravely ill when he was 35, and was certain he was going to die. Wanting to prepare himself for Heaven, he began to meditate on Heaven and what it would bring – on the joys of the resurrection. In that book he suggests that Believers ought to meditate on Heaven 1/2 hour each day.